The Virtuoso Group, Inc. has been active in the vintage and boutique guitar industry since 1995. The genesis was Virtuoso Vintage Guitars, Inc., which was started in a quest to provide a better alternative to serious collectors who sought out world class instruments. Virtuoso’s specialty was pre war Martin and Gibson acoustics, Custom Color Fender instruments and rare Gibson’s. In the years that Virtuoso Vintage Guitars was in business, their offerings (and subsequent sales) included pre war Martin D-45’s, OM-42’s and OM-45’s, civil war era Martins, numerous Fender Custom Color and maple neck Strats and Teles. The Gibson offerings included everything from Orville period mandolins, Style O’s and Harp guitars to “59 Les Paul Standards, dot neck ES-335’s and rare limited editions like “The Les Paul”. Other notable instruments include the last guitar signed by C.F. Martin the III, a rare 10 screw pickguard ’59 Stratocaster (Custom Color, birdseye maple neck, no neck date), The Gary Josey D-45 and Mike Longworth’s employee 1968 12 fret Slothead D-45. Virtuoso Premium Polish and Virtuoso Premium Cleaner grew out of the need to care for these instruments. Even though they may have been world class instruments, when we got them they weren’t always in world class condition. 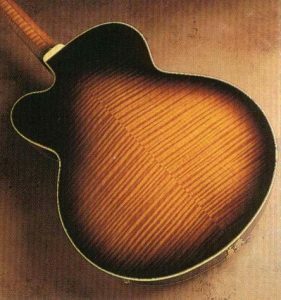 The guitar care products available in 1995 would not clean the finishes without either (a) adding to the grime or (b) damaging the finish. We set out to find a chemist capable of helping us develop a guitar care system that would allow us to clean years of accumulated dirt and grime without lifting or damaging the finish and also help protect the finish and wood underneath going forward. After numerous attempts and formula changes we arrived at the products now known as Virtuoso Premium Polish and Virtuoso Premium Cleaner. It is the only two part cleaning system designed specifically for nitrocellulose lacquer finishes. It also works wonders on polyurethane and UV cured finishes found on newer instruments. The products were designed and developed to help prepare our instruments for sale, not specifically as a resale item. 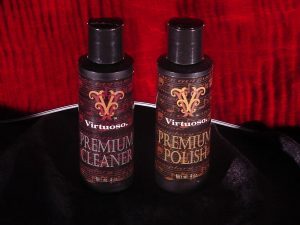 Only after numerous requests at vintage guitar shows did we decide to offer Virtuoso Premium Polish and Virtuoso Premium Cleaner for sale to the public. Please read our Directions for Use before using our products on your instruments. Try some and find out why serious collectors around the world won’t use anything but Virtuoso Premium Polish and Virtuoso Premium Cleaner on their instruments. We invite you to visit our comments page which contains numerous Customer Feedback page about Virtuoso Premium Products. Copyright © 2019 The Virtuoso Group, Inc.. All rights reserved.